Added a new section in What Should I Collect? on computer chip paperweights. I finally addressed the big question today. I added a new section under Chip Collecting, Why Collect Computer Chips? Collecting computer chips is fast becoming a hip pastime! Perhaps vintage is a better term than antique, but in Internet years, integrated circuits have been around for more than 150 years. It is absolutely amazing the number and variety of computing devices that have been created and obsolesced since the 1960s. Integrated circuits are used for many purposes, but these pages focus primarily on vintage computing chips from the 60’s-80’s. This site is intended to be a reference for people interested in computer chip collecting. This is the first microprocessor. In 1971, for the first time, the functions of a computer were etched onto a single piece of silicon. 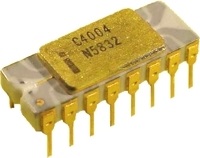 Click on the picture to learn more about the Intel 4004. Above is a “Gray Trace” Intel C4004. These are some the earliest versions of the 4004. Theses pages contain information on these vintage chips that is difficult to find. Most publications are written for hardware and software designers. Very few publications are suitable for collectors’ needs. How do you identify the chip? What do the markings mean? How can you tell which company made the chip? When was it made? How was it made? What is the history and significance behind the chip? These pages attempt to answer these questions. There is information here for the beginning and the advanced collector. Here you will find information about some of the most famous chips: Intel 4004, MOS 6502, and Motorola 6800, some of the most innovative: RCA 1802 and Rockwell PPS-4, and some of the more obscure: NEC uPD751 and National Semiconductor IMP-00A. Microprocessors seem to be the most common chips collected, so I have organized many of the pages around them, but I have tried to include other items of interest such as the memory chips, support chips, and other computing technologies.